NOTE: This content is old - Published: Friday, Sep 21st, 2018. Young people who are using digital tools to boost their work are being sought for a major awards ceremony. 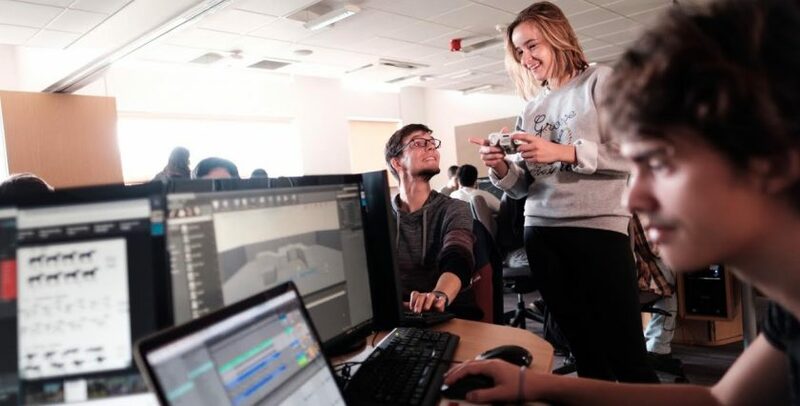 The Digital Futures Awards, taking place next month at Wrexham Glyndŵr University, are looking for people aged 25 or under who are harnessing the power of technology to transform their work to enter a special category. The Digital Young Person award, sponsored by Anglesey’s M Sparc, recognises those young people who are using technology to change the way they work. “The way technology is being used by young people nowadays is opening all kinds of channels – this is the generation which grew up on YouTube, Twitter and Facebook. “That openness to technology means that they are constantly forging new ways to promote their work, their campaigns and their businesses, and this year’s Digital Futures Awards wanted to recognise this growing movement. “That’s why we created this award, which is open to all kinds of submissions – from twitter campaigns to vlogging, websites to apps. The Digital Futures Awards have a range of categories, each with an individual sponsor. Delivered in partnership with Big Ideas Wales and Wrexham Enterprise Hub, they are designed to celebrate digital entrepreneurs across the region – with entries open to Wales, Cheshire, Wirral or Shropshire. Entries can be made up until October 8, when a shortlist will be drawn up in preparation for the Digital Futures Conference and Awards Ceremony, to be held in the University’s Catrin Finch centre on October 25. Digital Marketing Campaign – sponsored by NXT Web. This award is for those who have innovate in a digital marketing campaign, whether this is launching a new business or product or boosting charity fundraising to the next level. Judges are looking for creativity and a focus on timescales and impact. Digital Marketing Company – sponsored by FSB. This award is for a digital marketing company which has driven growth for businesses and clients, or a skilled individual or team who have secured proved results for clients. Online Business – sponsored by NatWest Cymru – An award for any online business which need celebration, whether it’s through boosting the work/ life balance of staff or improving the satisfaction of customers. Successful Brand – sponsored by Wrexham Glyndwr University. This award celebrates the power of digital media for boosting a brand. Judges are looking for innovative examples of how brands have been exposed and gained attraction through the power of digital. They are particularly keen to hear from small brands as well as larger brands. Digital Young Person under 25 – sponsored by M-SParc: This award is an open category, looking for a young person who has used digital tools and media to enhance their work – whether this is a project, hobby or business idea. Judges welcome a wide range of submissions – whether this is a blog, vlog, a twitter campaign, or even an app creation. Anyone interested in finding out more, or making a nomination, can email zone@glyndwr.ac.uk to receive an application to complete.